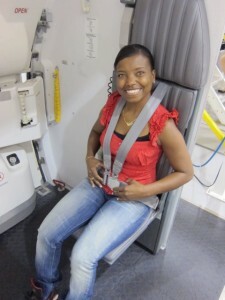 A flight attendant career is one of the most rewarding jobs for people who love to travel. Flight attendant jobs also have one of the highest number of job applicants in the travel industry. Our training program gives you an advantage. The Travel Academy students set themselves apart from the rest with a simulated flight attendant work environment and hands-on flight attendant skills training. 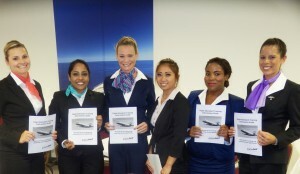 Airlines trust our graduates and offer flight attendant jobs to students while still in class! This fun and exciting flight attendant school provides the opportunity to build confidence, build lifetime friendships, and experience first hand what it is like to live the life as a flight attendant. Flight attendants are often called upon to share hotels on overnight stays. Our flight attendant school experience extends beyond the classroom and students who use Student Housing Services prove to employers that they are able to live “life on the road” and know how to be good roommates. According to studies, it takes an average of 66 days to create a new habit. That works out to just under 9.5 weeks. Our 10 week flight attendant school is designed to help shape your habits into a flight attendant professional. Not just traditional book studies, but working in a “hands on” capacity, learning to talk with confidence and practicing the activities of a professional flight attendant. Aircraft Diagram, abbreviations and where to find necessary equipment. Examples include: APP, AED, EFL, ELT, FAK, FAM, HSO, ILV, MEG, POB, SBX, and XMK. Time Management, time conversions and calculations – you will learn what they are and how to use them. Security and Badge Management – Each student is issued a security badge which is used for access to each class, similar to gate security access at the airport. Flight Attendants need to know 100-200 city and airport codes, and 150-300 aviation-specific terms and phrases. Students not only learn the codes and phrases, but also how to use them. Flight Attendant customer service – Having a flight attendant job means that you are representing the airline each time you put on that uniform. The Travel Academy flight attendant school provides training that can be used to obtain flight attendant job and in any other travel or customer service career for the rest of your life! Interview techniques – how to get hired as a flight attendant or other exciting jobs. Build Confidence – The Travel Academy provides individualized attention and provides an easy one-step-at-a-time approach to helping you feel more powerful and in control of your career. A résumé is your personal advertisement and one of the most important tools used in obtaining a flight attendant job. Learn how to turn your story into a résumé that can help you land a flight attendant job and provides what travel employers are looking for. How to apply for flight attendant jobs and create cover letters for airlines. Just the flight attendant application process can take 1-2 hours with each airline asking a different set of application questions. We teach you the secrets of those questions, what they mean, and how to make sure your application stays out of the “rejected” pile. Best Travel Deals – Flight Attendants often receive free airfare for themselves, family members and sometimes friends. Our school provides training on how to find the best deals on vacation packages, hotels, and car rental which is not available to the general public. This alone can save you thousands of dollars.